The Nacoochee United Methodist Church Cemetery was started in 1833 when the wife of Major Edward Williams was buried on a nearby hill. Major Williams gave six acres to build a church and cemetery. 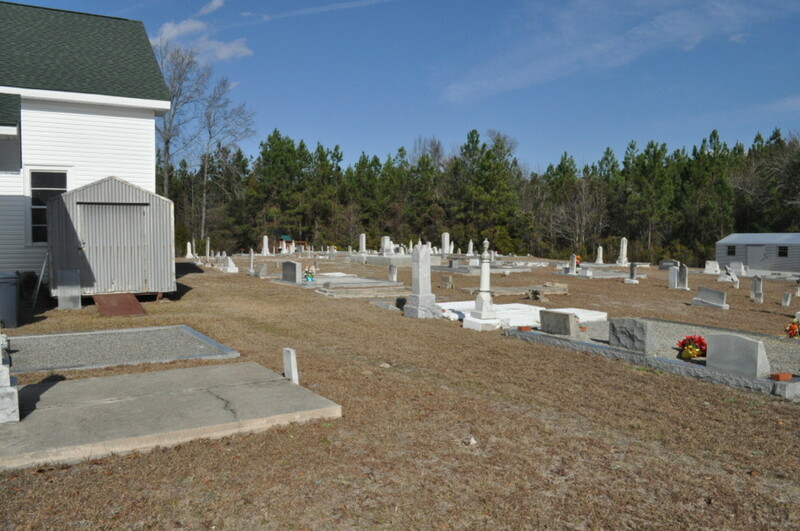 The cemetery contains the graves of early settlers and their slaves who arrived in the Dukes Creek and Nacoochee and Sautee Valleys area in the 1820s. 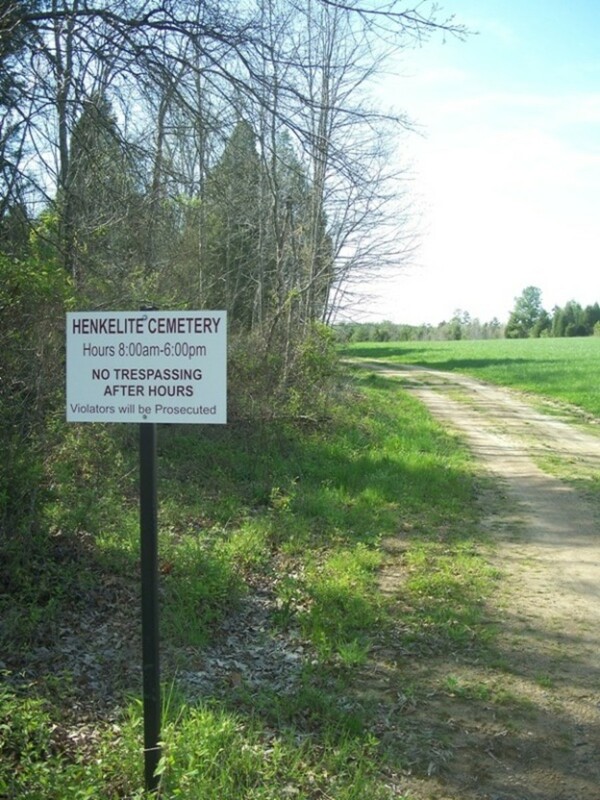 Located in Sautee in White County, there are over 700 identified graves. 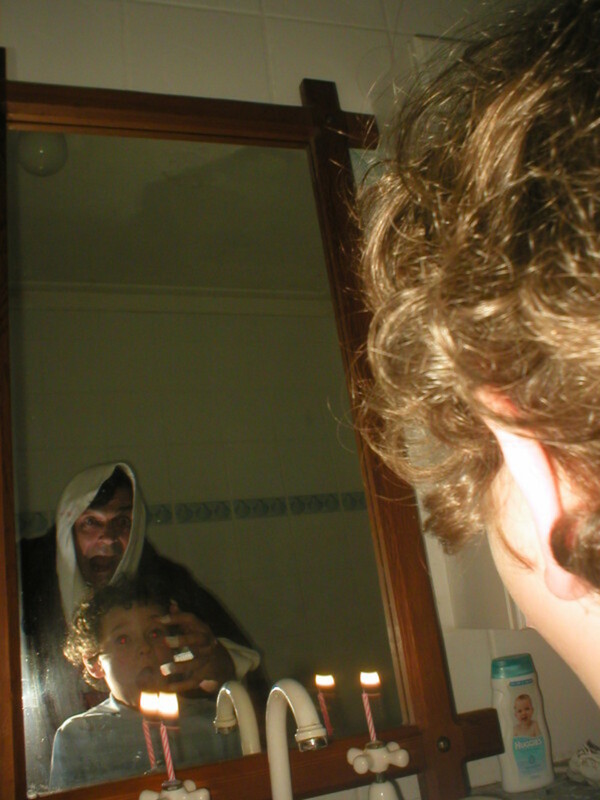 The best known ghost here is that of a little girl. After her burial her father built a dollhouse over the top of the grave “to protect her from the rain.” Legend has it that the man who killed her was hung from a tree in the cemetery and that if you stay by her grave for a while she can be heard crying. 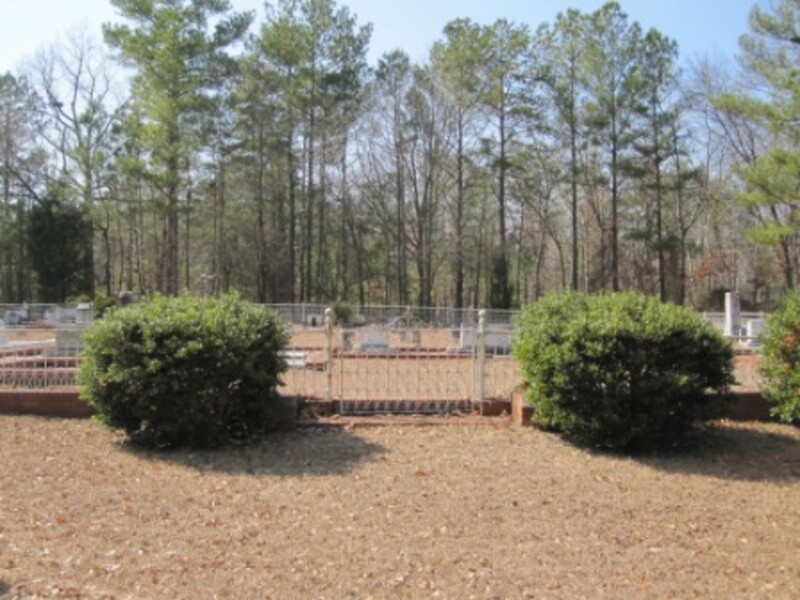 The Bethlehem Baptist Church Cemetery lies six miles east of Cedartown in the Fish Creek community. Located in Polk County, there are around 500 interments beginning in the mid-1860s. 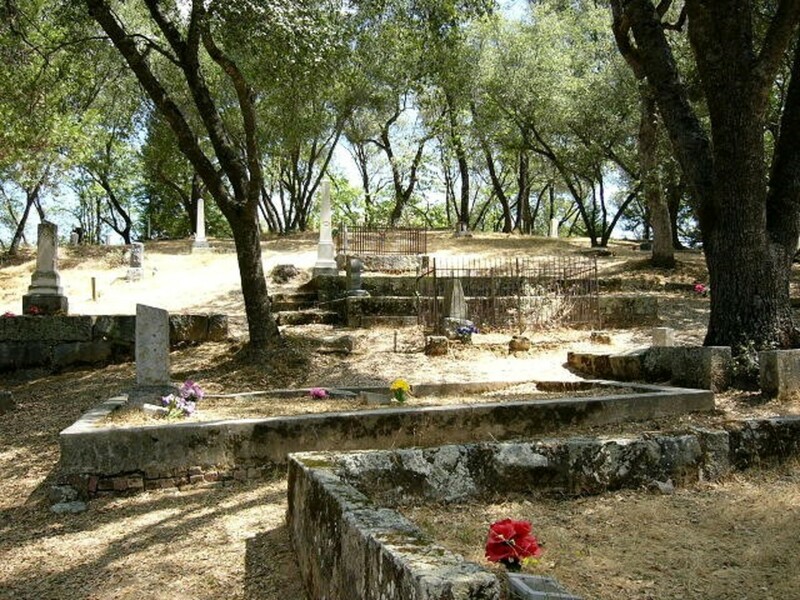 This cemetery does not have a particular ghost, but many different apparitions are seen wandering through the graveyard at night. There is a pasture next to the cemetery that has a ghost horse that is walking around or seeming to graze. 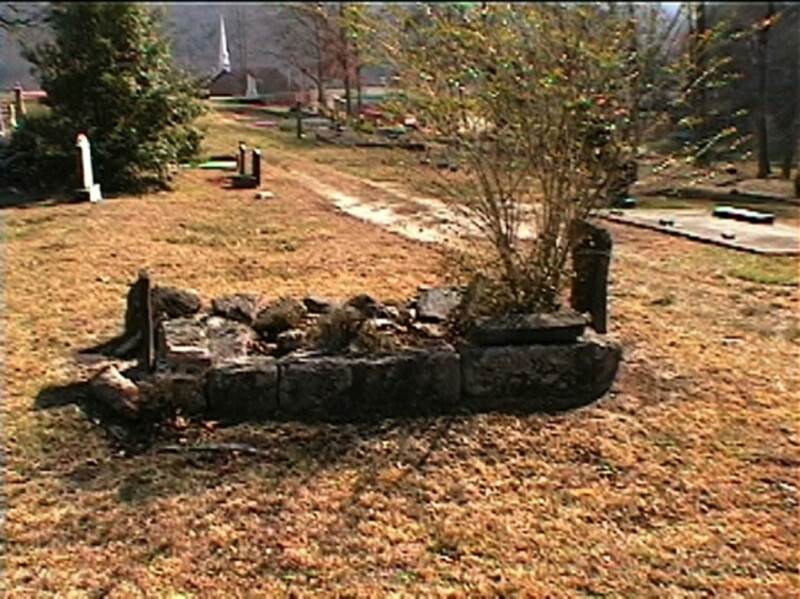 The Jackson Street Cemetery is also known as the Old Athens Cemetery. It was started in the early 1800s near Athens in Clarke County. 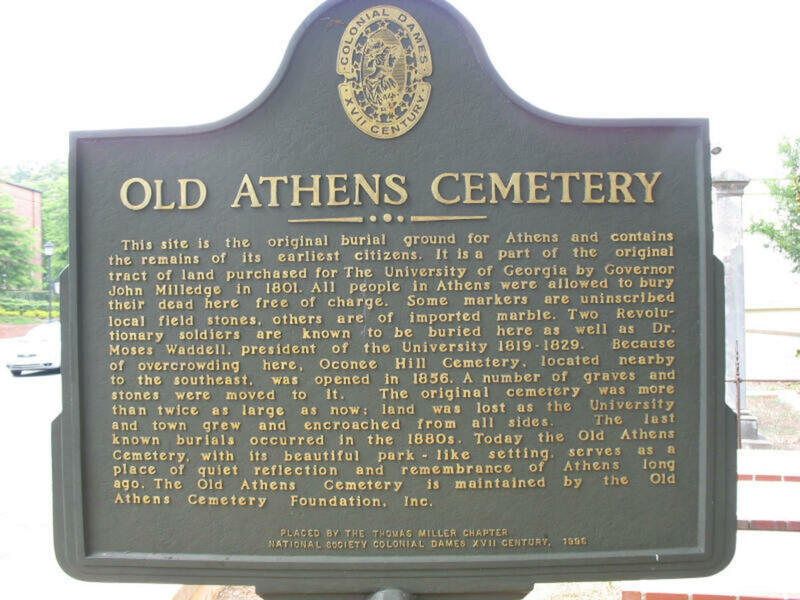 It was the first cemetery in Athens and is on the National Register of Historic Places. It is located on the grounds of the University of Georgia next to the Lamar Dodd School of Art. The last known burial was around 1898 and there are around 75 interments. One of the named ghosts here is Chancellor Walter Hill. He had planned to restructure the University and part of his restructuring plan included doing away with the cemetery. He died shortly after making this announcement. The chancellor has been seen walking in the cemetery, mostly at night but occasionally during the day. A young girl has also been seen wandering the grounds. The Georgia Haunt Hunters team has recorded temperature fluctuations throughout the cemetery but more so at the Conger family plots. Feelings of being watched have also been reported. Oakland Cemetery is the oldest cemetery in Atlanta. It was originally called Atlanta Cemetery when it was founded in 1850 southeast of the city. It began as six acres and now covers 48. It has over 25,000 interments. There are somewhere between 3,000 and 4,000 Confederate soldiers buried here and there is a statue here honoring The Unknown Confederate Soldier. The statue is of a wounded lion. Many people have claimed to hear The Roll Call of the Dead being read in the vicinity of the statue. The Sappington Cemetery is located on Bush Road in Barnesville in Lamar County. It has around 160 interments, almost half of which are from the Sappington family. The oldest marked grave is from 1843. There is quite a bit of haunting activity in the cemetery. Visitors have claimed to see full-bodied apparitions just wandering through the graveyard. Disembodied footsteps are heard on the gravel. Perhaps the strangest thing is the cold spots. While many haunted cemeteries have cold spots, the ones here have actually had temperature readings below zero. Waverly Hall Cemetery is located in the small town of Waverly Hall, population 800, in Harris County. It is part of the Columbus, Georgia-Alabama Metropolitan Area. One of the oldest graves here is that of The Reverend Thomas Darley (1760-1832). He was a Revolutionary War officer and a Methodist minister who founded many Methodist churches throughout South Carolina and Georgia. There are approximately 800 interments here. The Waverly Hall Cemetery appears to be quite haunted. 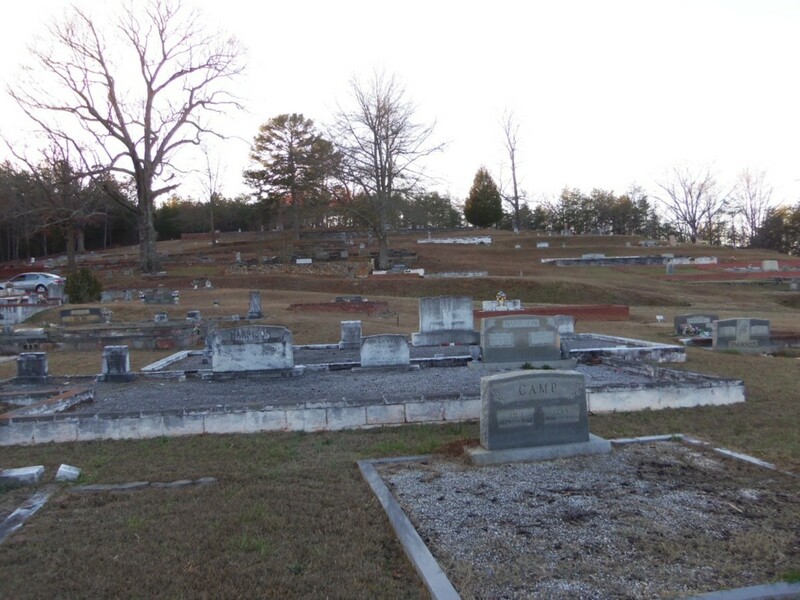 A couple traveling to Lanett, Alabama decided to stop by the cemetery after reading an article about it. They took a few pictures on a digital camera and then left just before dark. They both claimed to have felt sick to their stomachs as they left. The woman started scrolling through the pictures and became quite distressed. She asked her boyfriend to pull over and look at the pictures. Just as he did all her pictures vanished, not jonly the ones she had just taken. They stopped at a CVS and the woman who worked there said the memory card was bad. They replaced it and the camera worked fine. They returned to the car and the woman, who was visibly shaken told her boyfriend that the “worker” in the store looked just like the woman she had seen in the pictures. Paranormal investigators have spent a lot of time here. One claimed to have stepped out of his car and heard an inhuman screech and the sound of someone running toward him. Many apparitions appear here and there are quite a few cold spots. There have also been several EVP (Electromagnetic Voice Phenomena) recorded here. Andersonville National Cemetery is on the U.S. National Register of Historic Places. 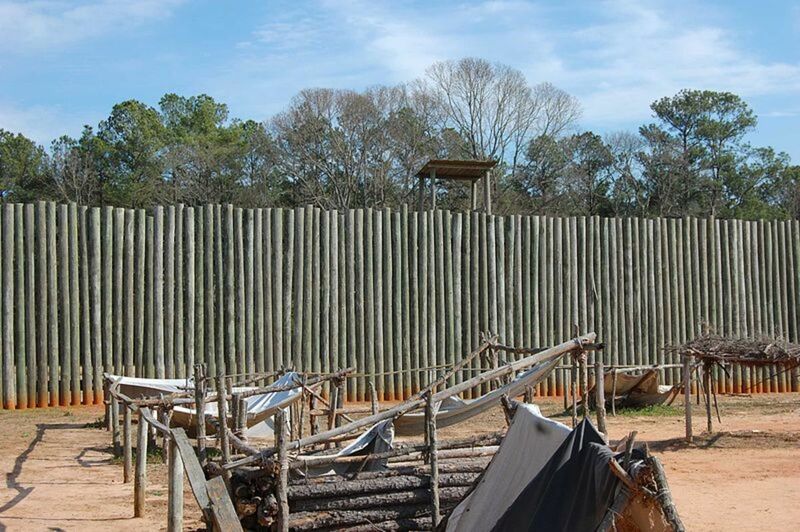 It preserves Camp Sumter which was a Confederate prisoner of war camp during the last year of the Civil War. 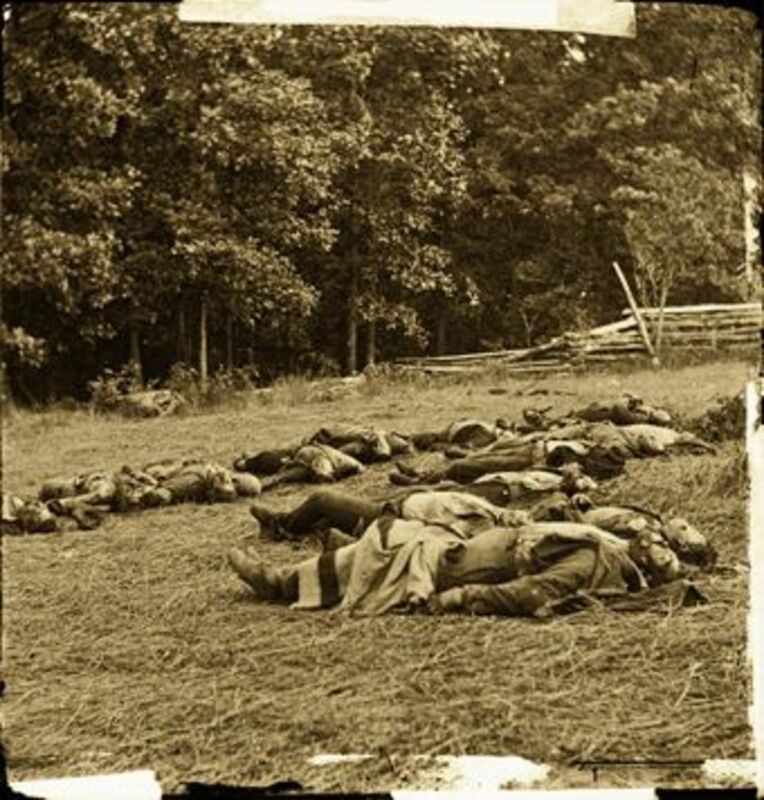 Of the 45,000 Union soldiers held there, almost one third of them died. 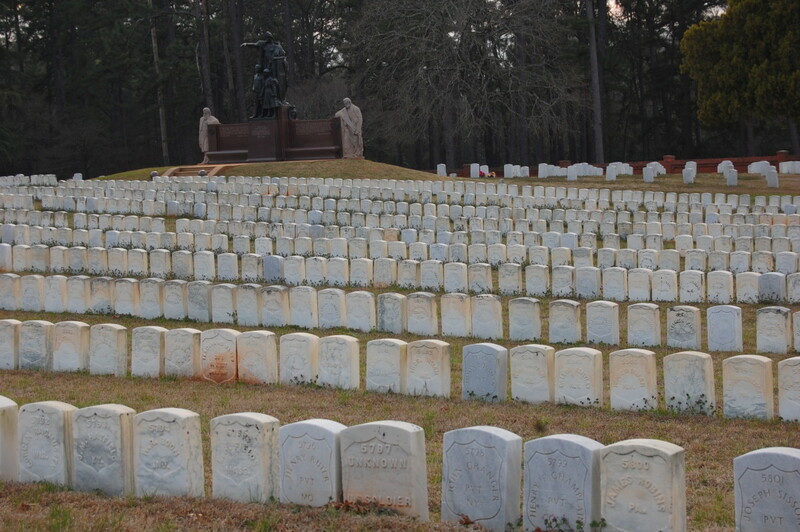 It is located near Andersonville in Macon County and has over 20,000 interments. The Andersonville Prison Cemetery is considered one of the most haunted Civil War prison cemeteries. During the night and late evening many people hear the sounds of gun shots. Many experience a feeling of fearfulness just from being on the grounds. Several have reported a smell that is so foul, it literally takes their breath away. Because of the geography of the location of the cemetery fog occurs here quite regularly. People claim to hear faint whimpers and whispers, and loud yelling and cries. Distinct figures have been seen walking through the fog. Bay Springs Baptist Church Cemetery is located near Scott in Johnson County. There are a little over 300 interments here dating back to the 1890s. The legend associated with this cemetery concerns a man who was a devout atheist and considered to be quite mean. One night he walked out into the middle of a field and yelled, “If there is a God, then strike me dead!” God obliged and he was killed instantly by a lightning strike. During his funeral lightning struck his casket and to this day his tombstone is struck by lightning on a regular basis. Voices and strange noises are often heard coming from the church building. Bonaventure Cemetery is located on a bluff of the Wilmington River east of Savannah in Chatham County. 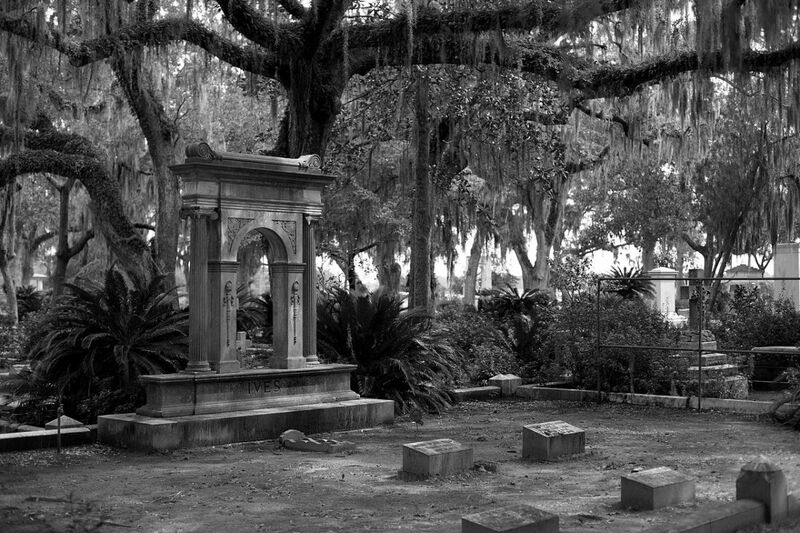 This cemetery became famous when it was featured in the novel and movie Midnight in the Garden of Good and Evil. 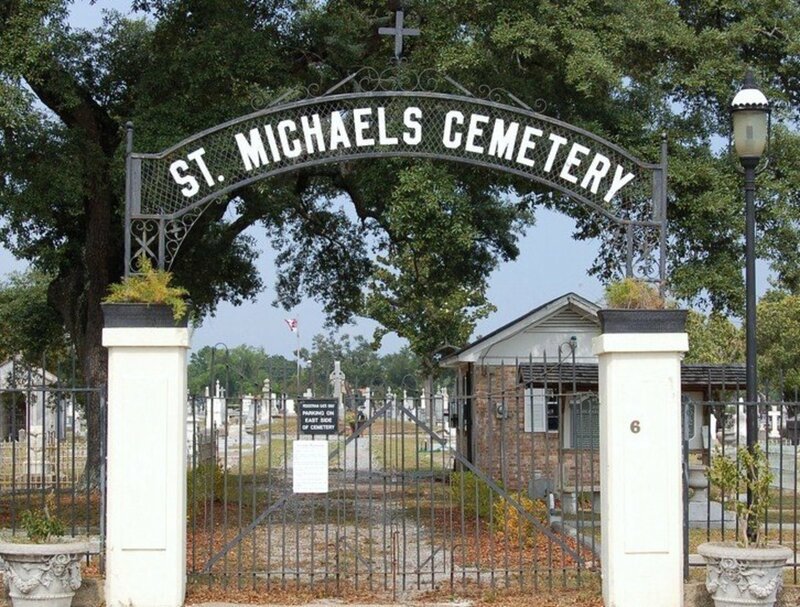 It is the largest cemetery in Savannah covering nearly 160 acres. There are approximately 30,000 interments. There are several ghosts haunting the cemetery. One is a little girl named Gracie Watkins. Her monument is a life-sized statue of her. Visitors will place small presents in her open hands. If someone removes one of the gifts it is said she cries tears of blood. There is also a pack of ghost wolves or dogs that roam the cemetery. They are never seen, only heard and felt. 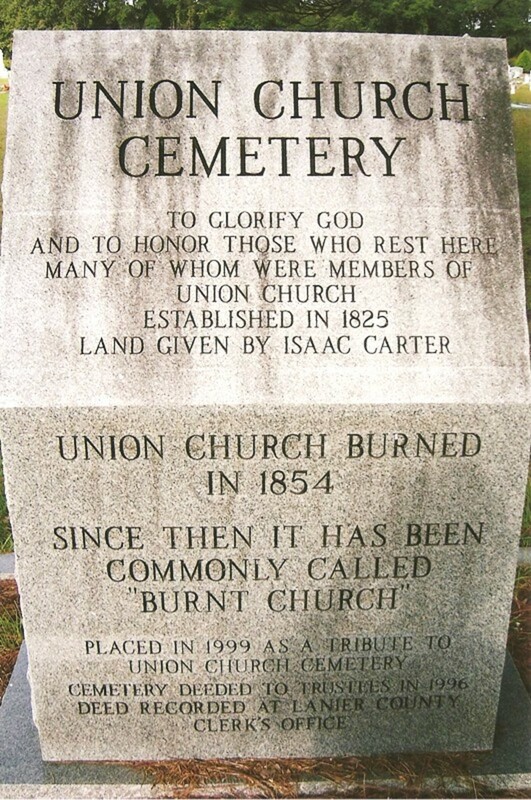 The Union Church Cemetery is located in Lanier County on the edge of Lakeland, 10 miles of where the first pioneers to the area settled on Beaver Dam Creek in what is now Ray City. 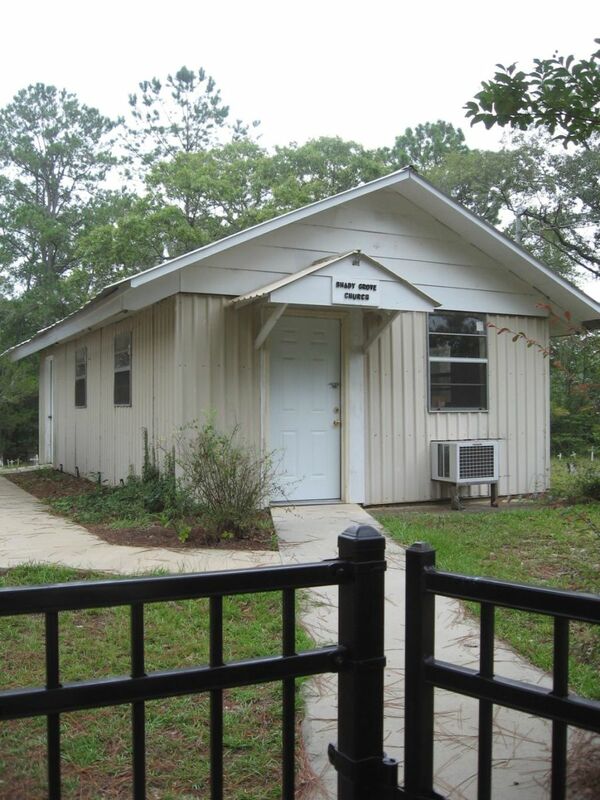 It was established in 1825 on the Alapaha River. It is also called Burnt Church since it was partially burned during the Indian Wars between 1836 and 1838. There are almost 800 interments. The oldest marked grave was that of James Allen in 1821. The legend associated with this cemetery is quite gruesome. Supposedly the burning of the church, which was also a school, was not caused by the Indian Wars at all. The townspeople believed that the teacher was indoctrinating the children to be Satanists. To keep that from happening, they torched the building with the teacher and children still inside. The children’s graves are marked only with wooden crosses, no names or dates. The teacher’s grave is next to the children’s and marked only with a four-foot-high stack of bricks. 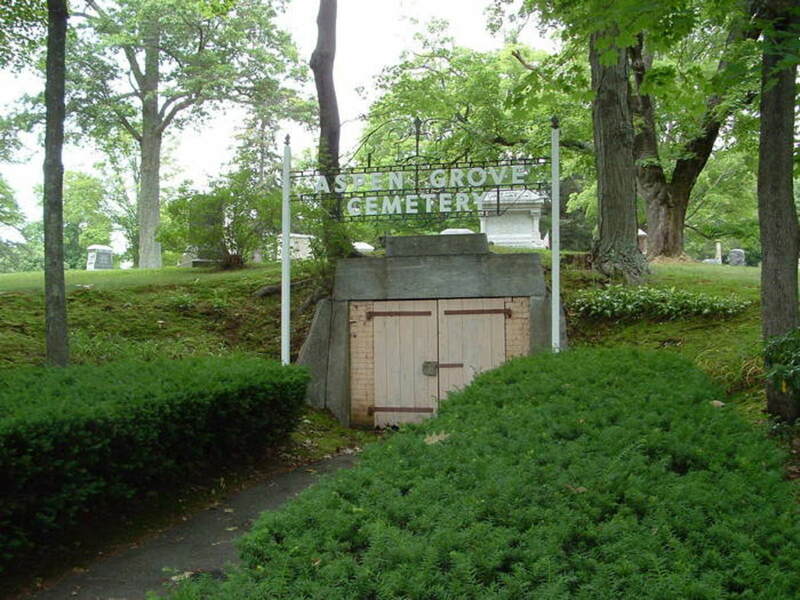 Shade Grove Cemetery is located on Duck Road just outside of Sale City in Mitchell County. It has a little over 100 interments dating at least to 1878. There are many tombstones without dates. Several instances of paranormal activity have been reported here. In the middle of the cemetery there is a small prayer chapel. High pitched sounds and moans have been heard coming from inside. Sometimes a glowing light seems to be emanating from underneath the little chapel. People claim to feel a chill run down their spines when they enter the cemetery through the arch entrance. 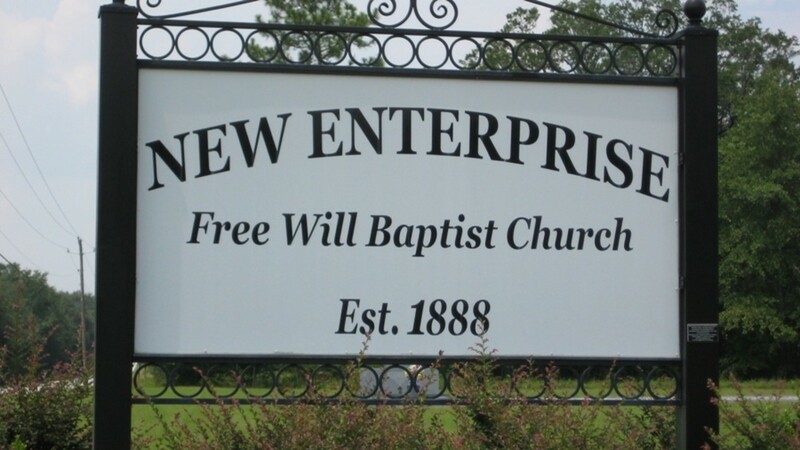 New Enterprise Freewill Baptist Church is located on Enterprise Church Road west of Brinson in Seminole County. There are approximately 300 interments dating back on 1898. There is a very large, black ghost dog here that howls but does not leave any tracks. The legend here is that sometimes a ball of fire is seen hovering above the cemetery. Supposedly, within a week someone dies and is buried here.